There is a turning point for everyone. A place where courage overtakes fear. A place where adversity reveals true heart and character. It is here, within the smoky haze of battle, that real heroes begin to arise, something stirring within them, fighting a fight they never asked for but pushing through nonetheless. marking severe afflictions and commemorating hard fought victories. along the way, not wanting to leave any behind. But the battle takes some. Still they journey on; for the time demands it. They will not forget. Nor will they lay the torch down. Perseverance surges through their exhausted bodies. Wisdom and experience holds them upright. And they war with an intensity that marks their call. They step forward for this fight. Praying for the strength to overcome. And they'll keep working until they get it right. Pressing on in fortitude they take charge. Believing the impossible to be possible, they change the atmosphere. revealing what could not be seen before. And then they emerge...as the real heroes they truly are. 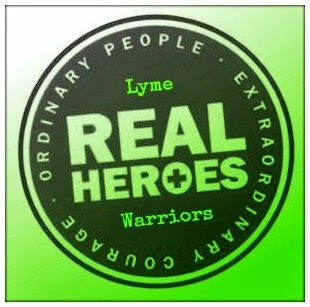 I've written this in tribute of all my fellow Lyme Warriors. I know the battle is hard. I know you're weary. And I also know you're stronger than you realize. You make a difference. You inspire and encourage. And you are some of the gutsiest, most kindhearted people I have the honor of knowing. Thank you for your friendships and support. You are heroes everyday. Keep on keeping on. Change is coming. Thanks so much Renee. Hugs, my friend.